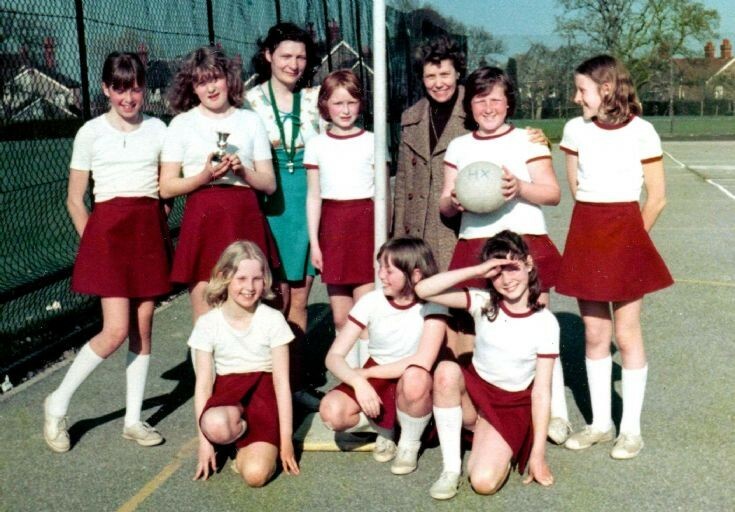 The photograph features the triumphant netball team from Handcross School. It is dated 1978, but details of the competition and its location are not supplied. Standing at the back are teacher and coach, Mrs Peggy Harrison, and headteacher, Mrs Rosslyn Stenning. A close inspection of the photograph will reveal the trophy! Please can anyone supply any details, including the eight team members? A maximum of seven players are allowed on the field of play, but substitutions are allowed at half time or for injury. The Large Version shows the team celebrating. Front row: Pamela Vowles, Mandy Watkins and possibly Carol Gibson. Back row: 2nd from left is possibly Joanne Cheeseman, 3rd possibly Sarah Mason, then Lynne Towner and one of the Turville girls-Jane?